Lasers are a natural fit for the latest generation of tailored blanks, hot-stamped parts, and safety-oriented designs of car bodies and structures. Editor’s note: This article is adapted from a presentation, “Trumpf Solutions for Hot-Forming Process Chain,” presented by Michael Fritz and Daniel Minh Maier, industry management for hot-forming, Trumpf. Some of the advanced steels used in today’s car-body manufacture are hard enough to tear up blanking dies and strong enough to require hot forming. And the combination of “lightweighting” and strict impact-strength requirements – contradictory goals – have forced the use of edge-welded sheets made of combinations of materials (tailored blanks) and blank forms with pieces of precisely located sheet stock welded in place as local reinforcement (patchwork blanks). Traditional blanking, forming, and welding methods are not up to the task. But it’s a field day for lasers. As they intrude further into high-volume car and truck manufacturing, they’re producing a classic case of new processes enabling new designs. The following few examples give an idea of the scope of capabilities they’ve added to building cars. 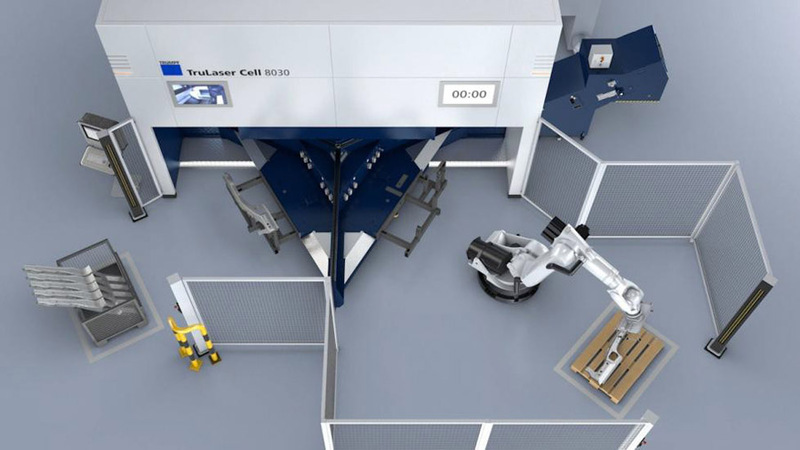 A TrueLaser Cell 8300, tailored for hot-stamped parts, is available with several degrees of automation. In the beginning, there was blanking – cutting flat sheets into stamping blanks with conventional press dies. Now lasers offer some advantages, including part flexibility and eliminating tool wear that can be much higher with advanced, high-strength steels (AHSS). The boron-containing hot-stamping steel alloys generally come with a coating, and that coating has to be removed – ablated. In order to get sound welds in tailored or patchwork blanks, the coating must be removed, locally, where the welds are going to occur. That’s another job for lasers. On to the oven and then hot-stamping. Stamping tools can wear quickly with AHSS steels, particularly when they’re run hot. This is another job for lasers: applying hard coatings to tools, via sintering or melting, and weld-repairing the base tool material itself. As a sidelight, hot-stamped parts may require local annealing to prevent brittleness at critical points. That’s one more job for lasers. For traceability, parts are often marked with numbers or a bar code – still another job for lasers. Patchwork blanks are an important innovation for building lighter, stronger cars. Instead of welding complex stampings in 3D to make a strategically-strengthened structure, flat blanks have patches welded onto them in 2D, before they’re formed. Stiffness and strength can be added exactly where it’s needed; there are fewer compromises made for welding accessibility. The result has better properties and it’s also a better fit. In some cases, it can reduce the number of body parts at final assembly by half. Attaching the patches currently is done by spot welding. 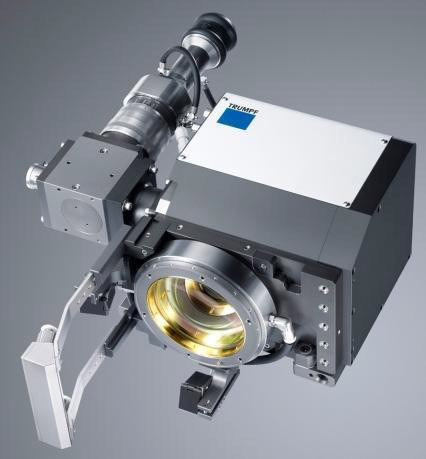 But the laser manufacturers, such as Trumpf, which is deeply involved in all of these recent processes, have their sights fixed on it. Research and testing indicate that there is no problem with the laser welds, and welding a typical patch with a laser, says Trumpf, takes 0.5 to 0.7 seconds, compared to 2.5 to 3 seconds for spot-welding the same patch. Closely related is welding tailored blanks. These are not new; they’ve been used since the late ‘90s. The “tailored” part means that the blanks are edge-welded from two different sheets, either different thickness or different alloys, or both. Their purpose is to allow a single blank to replace, typically, two or three, and to give better performance at the same time. The classical example is an inner door blank, thin and softer in the middle, but thicker and stronger where the door hinges are located. What lasers bring to the party, aside from high integrity and speed, is more geometrical versatility. They can weld the pieces along a complex line without slowing down. As with patchwork blanks, lasers have the capability to vary the weld depth without taking a breath. Tailored blanks can be as complex as necessary. One more laser capability that falls into this class of work is trimming or cutting holes in previously formed, 3D parts – even when the part is made of a hot-stamping steel that is strengthened to some value around 200 kpsi or more. Trim dies would have a stroke. Lasers just buzz right through it. 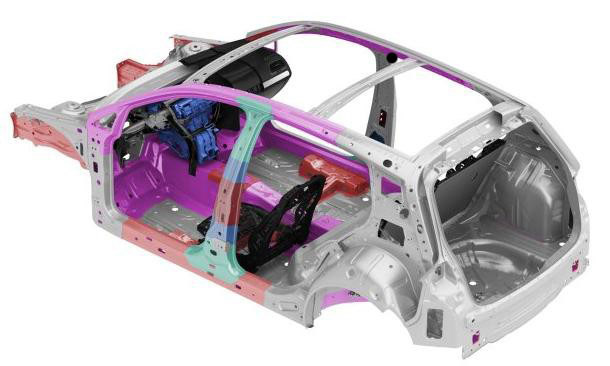 Areas in pink are hot-stamped parts, which are being applied in many vehicles where extreme strength is required. We mentioned that Trumpf has been involved in this end of the laser business up to their armpits. They have several machines that are ready to apply to any of the tasks mentioned above, with 3D-cutting machines, laser-cladding machines, and, of course, conventional flat-sheet-cutting machines. One machine in their line, the TruLaser Cell 8030, is a specialist at working with hot-forming steels and is already in its second generation. They have over 600 machines working on hot-forming steels. It has a variety of features tailored to this work, not the least of which is special way covers, cyclone extraction, and other protections to deal with the very abrasive dust that’s produced when cutting these very hard, heat-treatable grades of steel. In-process sensors and other automation gear the machine toward production applications. Welding patchwork blanks is the next job for lasers, replacing spot welders. We have mentioned little about welding, focusing instead on the range of applications rather than the details. Fear not; FAB Shop is updating our reporting on laser welding applications, of which these automotive tasks are a significant part. Look for it in May. And our sister publication, Shop Floor Lasers, is filling in every significant thing that we’re not covering. Watch both publications over the next few months for the latest developments.